These are made with glutinous rice flour, which gives them a unique chewy sort of texture. The stuffing can be interpreted with a lot of different ingredients- but do include the bok choy and water chestnuts for texture. Ground pork and chopped bean threads might be a nice alternative to the tofu- and there is a suggestion of duck here. In a bowl, combine all the filling ingredients, stir well. In another bowl, combine filling ingredients, using your hands to work dough together. It should be rather wet and just on the verge of sticking; adjust with more rice flour or water. Roll into a ball, wrap in plastic, let rest for 1/2 hour. Lay out about 18″ square of parchment paper. Dust it lightly with rice flour, then shake off the excess. Unwrap the dough, then knead for a minute or two until it becomes very smooth and homogeneous. Divide into 10 pieces. Take each piece and pat and pinch to form a 3″ diameter circle. Lay circles out on the parchment. 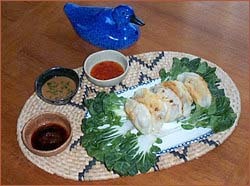 For each dumpling, pick up a dough circle, place some filling in the center, then fold over and pinch. The dough may have a tendency to crack- if it does, scavenge a patch from one of the other circles. As you form each dumpling, lay it back down on the parchment paper. Heat a frying pan over medium to medium high heat. Add some peanut oil, swirl around, then put in the dumplings. Press each one lightly to slightly flatten out its down side. After 2 minutes, it should be light brown on that side; flip and do the other side, again pressing slightly to flatten the down side. Then turn up the heat and fry both sides to a dark brown. The dough will puff in a most appetizing way. Remove to a plate, serve with dipping sauces (I used a pre-prepared Thai sweet chili sauce; a mix of vinegar, light soy, and Guilin chili sauce; and a hot sesame sauce made from Chinese sesame paste, chili-garlic sauce, soy sauce, stock, and scallions). Click to print this recipe as a PDF.